Pratibha Devisingh Patil, President of India, today said Doon School, which is a school for boys, should now open its doors to girl students. Once again, the Pakistan connection was revived at the Doon School with old Doscos from Pakistan sharing fond memories of the time spent at the school during undivided India. Alongside, efforts were also made to build new bridges with the Lahore-based Aitchison College whose Principal was a special guest today. Along with Major Mahesh Chand Sharma (class of 1937), Yogi Ranjeet (class of 1942) in saffron robes were the cynosure of all eyes. Reason: While Sharma is the oldest surviving Dosco, Yogi Ranjeet became a hermit some 15 years back. 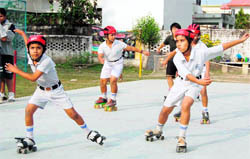 The XIVth Doon District Roller Skating Championship began today at the Olympus High School, GMS Road, here. In the girls 6-8 years adjustable skates category, Khushi Gupta of Raja Ram Mohan Roy (RRMR) School, Majra, emerged champion. In the 10-12 year group, Akansha Guha of Hilton School won. The Uttarakhand Open State Invitation Football Competition for 2010 was kicked off today at the DS Bisht playground here. The competition, organised by the Uttarakhand Sports Department and Uttarakhand Football Association, was inaugurated by Pitthoragarh SP Nilesh Anand Bahrane. Team iCARE, as part of its “Plant for the Future” campaign, conducted a green seminar with students of Doon International School on the school premises here today. The Rashtriya Indian Military College (RIMC) celebrated its sixth conservation festival today. This year’s theme was “Saving Indian Rivers”. The programme began with a conservation run in which students from various schools also participated. The chief guest was Rajendra Singh, also known as Waterman of India. The run was divided into four categories. DAV PG College is in no mood to conduct re-elections for the vacant posts of the general secretary and the vice-president. Both posts, which were earlier withdrawn by the elected members of the students’ council for producing bogus certificates, will remain vacant. Students in a gay mood bid adieu to Grafest 2010 held at Graphic Era University here today. The annual function was entirely a fun-filled programme that mesmerised guests as well as students. Speaking at the platinum jubilee celebrations, she said the school should pave the way for the entry of girl students. “Girls are excelling in several fields and it is time that they also had access to quality education being imparted at the school. They too should be given a chance,” she said. The President said primary education was now a fundamental right, thanks to the efforts of Union Minister for Human Resource Development Kapil Sibal. “We are moving towards universalisation of education at the secondary level and higher education is being accorded priority. This will require commitment and performance on the part of the stakeholders. “For the overall development of children, the education system must look at holistic development of youth of the country and the curriculum should be drafted in a manner which gives students an understanding of the world,” she said. Appreciating the village development projects started by Doon School, the President said, “I am told that Doon School has supported village development projects. These efforts will go a long way in inculcating values of dignity of labour and sensitivity towards others,” stressed Patil. The plea to make the school a co-educational one was also made by Governor Margaret Alva. Alva said along with becoming a cradle of education, the school had become synonymous with success, producing exceptional men and women who had made a mark in different fields. Making a departure from formal speeches, the young King of Bhutan Jigme Khesar Namgyel Wangchuck preferred addressing the students as friends and asked them to live life to the fullest. “Let your life be a marathon. Pace it wisely and don’t make it a 100m dash,” he said. Earlier, Headmaster of Doon School Peter McLaughlin said that the school was a jewel in the Indian education system. “It can never be a pale imitation of any other school, but is exclusively the Doon of India,” he stressed. Analjit Singh, Chairman, Board of Governors, said having completed 75 years, Doon School was now seeking to be an Indian treasure with an international reputation, a beacon of excellence and a proud flag-bearer of India in the 21st century. Once again, the Pakistan connection was revived at the Doon School with old Doscos from Pakistan sharing fond memories of the time spent at the school during undivided India. Alongside, efforts were also made to build new bridges with the Lahore-based Aitchison College whose Principal was a special guest today. Busy in conversation with his mates in immaculate Urdu, Zafar Khan (1946) of Jaipur House was the last school captain of Doon School in undivided India who later migrated to Pakistan. “Those were golden years. We were called for the Sunday morning ritual at the Jaipur House building. It has undergone major transformation, but several things are the same as if it was yesterday,” said Khan. Finding no difference between the schoolboys in India and Pakistan. “Boys are boys every where - be it India or Pakistan, but the process of refinement can only take place at boarding schools. “As soon as we entered the school gates, we were told that you are now alone. Your ancestors do not matter. The time that you spend here will make or break you,” said the affable Zafar Khan, having a sumptuous meal at the Doon School with his buddies Vijai Kapur and Jagdish Malhotra. “I am meeting Malhotra after a gap of 60 years. He has been avoiding me and now I have caught him. But I did manage to meet Kapur during the golden jubilee celebrations,” said Zafar Khan. His elder brother Afzal Khan (1944), now on the Board of Governors in Doon School and a resident of Islamabad, felt happy that the alma mater still manages to value his opinion. Commenting on the school, he said that it had become smarter and is no longer shabby. “We were jack of all trades. The stress on all-round development ensured that we participated in every conceivable sports activity in school,” he stressed. On the other hand, Fakir Syed Aijazuddin, Principal, Aitchison College, said that youth all over the world share the same ideals and with constant interaction, a long association between schools could be formed. “In the past 10 years, there was no exchange between us and the Doon School. Our ties were suddenly snapped. At a meeting with the school authorities and the Board of Governors today, we have decided to revive these. 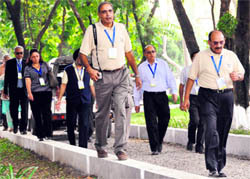 Soon, a delegation from Doon School will visit us followed by our boys returning the courtesy call,” said Fakir Syed. Fakir Syed had also visited India in 1978 and the college shares brotherly relationships with Yadvinder Public School, Bishop Cotton School, Shimla, and Mayo College, Ajmer. Sharma was in the Tata House and Ranjeet in the Kashmir House, but both thought it fit to participate in the 75th anniversary. 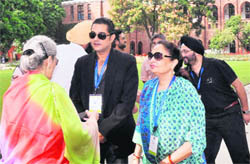 Others who were spotted included columnist and television personality Karan Thapar, who when asked to comment about President Pratibha Patil suggestion of making Doon School a co-educational school remarked, “The school was set up as an exclusive boys school as the need was felt for this kind of school only. All over India, convents exist imparting education to girls only, because they were meant to be just that,” he said. In the evening, while addressing parents and students, Headmaster Dr Peter McLaughlin said despite the President’s suggestion, the school would continue to be a boys’ school. He said the school was ready to take a big leap in the 21st century through it’s students who were expected to contribute towards an increasingly meritorious society. He said the school was expected to raise Rs 120 crore in the next 10 years, and 25 per cent of the funds would be used towards scholarships and teachers’ training. A two-minute silence was also held in the memory of Sheel Vohra, a former Doon School teacher, who passed away recently. The XIVth Doon District Roller Skating Championship began today at the Olympus High School, GMS Road, here. In the girls 6-8 years adjustable skates category, Khushi Gupta of Raja Ram Mohan Roy (RRMR) School, Majra, emerged champion. In the 10-12 year group, Akansha Guha of Hilton School won. Riya Singh of Olympus High School got the first place in the 12-14 year category. In boys’ 0-6 year event, Arnav Guha of Hilton School, Lakhan Taneja of St Joseph School and Janu got first, second and third place, respectively. Aditya of Olympus was the winner in the 6-8 year event. Mayank Kamoj, Aditya and Subrat Joshi, all of Olympus, clinched the first, second and third positions, respectively, in the 8-10 year event. Ranjan Pratap of Raja Ram Mohan Roy School claimed the first place in the 10-12 year category. Hardik of Olympus stood second and Ankit Tyagi of RRMR School got third place. Mayur Pandey of RRMR School got first place in the 12-14 year event. 10-14 year: Priyal Agarwal (Kasiga School), Mitali Handa (Asian School). The Uttarakhand Open State Invitation Football Competition for 2010 was kicked off today at the DS Bisht playground here. The competition, organised by the Uttarakhand Sports Department and Uttarakhand Football Association, was inaugurated by Pitthoragarh SP Nilesh Anand Bahrane. “Eight football teams from across the state are taking part - Blue Cantt Dehradun, Sports Hostel Dehradun, Sports College Dehradun, Sports Hostel Haldwani and teams from Pitthoragarh, Tanakpur, Gopeshwar and Ramnagar,” said Vinod Singh Waldia, District Sports Officer, Pitthoragarh. The competition will continue till October 27. Prakash Pant, Uttarakhand Minister for Drinking Water and Parliamentary Affairs, will be the chief guest for the valedictory function and will give away the prizes. The campaign is an ambitious project undertaken by iCARE, along with members from the Aagaas Federation, to spread awareness about the need to preserve the environment as well as, of course, plant more trees in the valley. Its aim is to create a close-knit community of enthusiastic citizens concerned about the plight of our planet and keen to make it a better place to inhabit. So far, schools such as Carman School, Touchwood School, Sai Grace Academy, KV BHEL, Apollo International, Beverly Hills, Sunrise Academy and Dehradun Hills Academy have taken part in this initiative. The ultimate objective is to enlist as many schools as possible in the campaign in order to realise our target of making the valley greener. Students and staff of the school, along with members of iCARE and Aagaas Federation, planted trees like chandni, gulmohur, kachnar, kapoor, etc. Many saplings were also donated by the Aaagas Federation to some staff members and workers of the school as part of its ambitious goal of reducing air pollution in the valley. Yudhishter Puran Singh, founder of iCARE, was very pleased with the enthusiastic participation of the students of Doon International School. In his words: “I want to reach out to the heads of educational institutions and make them realise the important role they have to play in motivating their students to work towards creating a beautiful and sustainable tomorrow. After all, it is their future which is at stake. Let us be honest with them and give them a fair chance to save what’s left”. Gaurav Gupta, on behalf of iCARE, stated that, “This event was long overdue. We had plans to conduct this event on September 22, but due to some unavoidable reasons we had to defer it. We were all excited to be a part of this programme as it saw a healthy interaction between participants. Some viable solutions were discussed which could pave the way for a greener tomorrow. Thank you all for your kind support and encouragement in this noble venture”. Shubhankar Prateek Lal, head boy of Doon International School, gave vote of thanks. “It was indeed knowledgeable and motivating. We all look forward to participating in more of these events that can bring us closer to our mother Earth”. The Rashtriya Indian Military College (RIMC) celebrated its sixth conservation festival today. This year’s theme was “Saving Indian Rivers”. The programme began with a conservation run in which students from various schools also participated. The chief guest was Rajendra Singh, also known as Waterman of India. The run was divided into four categories. The results: Under-14: 1st - cadet Hemant Poonia, 2nd - cadet Rishav Raj, 3rd - cadet Mohammed Salman. Above-14: 1st - cadet Rahul Mishra, 2nd - cadet Harsh Arora, 3rd - cadet Ankit Shukla. Under-50 (men): 1st - Wg Cdr YS Panghal, 2nd - Nk Sub KS Bafila. Girls: 1st - Richa, 2nd - Padmini Sharma, 3rd - Ujwala Dalvi. 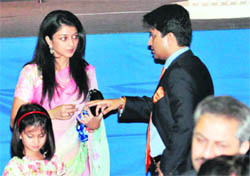 This was followed by a function at the Thimayya Auditorium. The first speaker was Padma Vibhushan Sunderlal Bahuguna. He spoke about the Green Revolution, Chipko Movement and conservation of forests. This was followed by an interaction with Rajendra Singh, Magsaysay awardee, on water conservation. He told the gathering about how he solved the problem of rivers and water in Rajasthan. He said that due to excess extraction of underground water, the level of water had become zero. This had led to the migration of villagers to cities, where the outskirts had turned to slums. Then, he had started recharging the water table by rain-water harvesting and gradually, water had re-attained its level. Dr Anil Joshi, founder of HESCO, a non-governmental organisation, emphasised on ‘gharats’ and talked about independent villages. He mentioned that 15 years ago, no one had thought of packaged water bottles. He said that it would not be a surprise if we have oxygen cylinders in families 20 years hence. Sandeep Puran Singh briefed the audience about how one should be self-motivated towards conservation. “Instead of telling others to conserve, we should take the first step,” he said. Diwan Singh, an alumni of the RIMC and a famous environmentalist who founded the Ridge Bachao Andolan and Yamuna Bachao Andolan at New Delhi, also shared his thoughts. The gathering was also addressed by Col S Rana, Operational Head, WWF, and VK Shrivastav, Circle Head, Punjab National Bank. According to Principal of the college BL Nautiyal, “It is 99 per cent sure that the college will not conduct re-elections now. We have sent a report to the high-powerd committee constituted by the university to study the recommendations set up by the Lyngdoh Committee”. “HNB Garhwal University had constituted a high-powerded committee in 2007 to study the Lyngdoh Recommendations, which says that the college has no provision of conducting mid-term elections in one academic session. A 13-member committee has decided to send a letter to the varsity seeking their guidelines on the issue,” affirms Nautiyal. The main attraction of the last day was an pop show performed by Punjabi singer Daler Mehandi. Students thoroughly enjoyed the colourful musical evening as they danced to the super-hit songs of the pop singer. The place was jam-packed with students and cheering crowd. Also, students of the institute presented a fashion show on the occasion. The show was divided into four rounds, including of formal-wear, creative-wear and winter-wear rounds followed by an ethnic round. Several competitions like mock press, solo and group dance and band war competitions were held during the day, while winners of other competitions were awarded. Eminent members from the varsity such as Chairman Kamal Ghanshala, Prof KP Nautiyal, Dr DP Giridhar, Chancellor, SC Sharma, Secretary, RC Ghanshala, Chief Patron and other faculty members were also present at the event. On Friday, on the second day of the annual college festival, several activities and competitions were organised under the meticulous supervision of the college management. There was a very large gathering of students from different colleges who came from far and near to participate. The students of the university also performed with anxiety and great fervour. However, in the evening the bad weather tried to cause hurdle in the extravagant event, but despite of the rain showers, renowned stand-up comedian Raju Srivastava managed to tickle the ribs of the students and guests. He did not only made the environment lighter, but also made sarcastic jokes on the prevailing conditions of India.